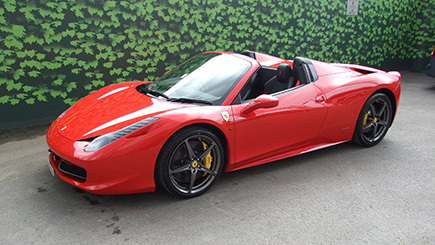 The ultimate dream of millions of petrol heads around the world, the sleek, blisteringly speedy Ferrari 458 Spider is a dream to drive. Slip into the leather seat of this legendary Italian racing machine and rev hundreds of horsepower to get the pulse racing before pulling off. Its 4.5 V8 is immensely popular amongst celebrities and race drivers and it's not hard to see why: it boasts an incredible a 0-60 MPH time of 3.3 seconds and an impressive top speed of 202 MPH. Built in conjunction with Michael Schumacher, the F1 influence can definitely be felt in its aerodynamics and its superior handling, and has earned it many prestigious awards. Four days in this car will be over all too soon, leaving drivers yearning for more. Drivers 30 - 65 years only. Full manual driving licence, held for a minimum of two years required, with fewer than 6 points. A credit/debit card deposit of £7,500 is required on collection.